India will purchase four additional Boeing P-8I Poseidon aircraft. On Wednesday, the Indian Defense Ministry announced that it had cleared $4.74 billion for the purchase of new military equipment, including four long-range military patrol aircraft from the United States. Specifically, India will purchase four additional Boeing P-8I Poseidon surveillance aircraft, among the most advanced maritime intelligence, surveillance, and reconnaissance (ISR) aircraft currently available. India placed an order for eight P-8I aircraft in 2009—the latest order is for an additional four units. The P-8I is an export variant of the P-8A Poseidon, designed for the needs of the Indian Navy. Notably, it features a Telephonics APS-143 OceanEye aft radar and magnetic anomaly detector not present on the original P-8A. 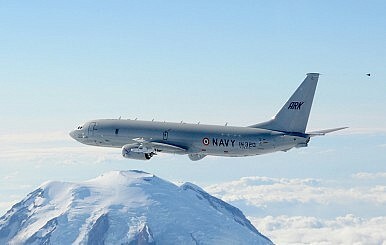 The Indian Navy has a total of eight P-8Is on order and deliveries began in December 2012. So far, as of this order, seven P-8I aircraft have been delivered to the Indian Navy. With the delivery of the eighth expected later this year and the new approval, the Indian Navy will operate a total of 12 P-8I aircraft in the future. India was Boeing’s first international buyer for the P-8I, and the order of an additional four units has been expected for some time. Operationally, the Indian Navy’s interest in bolstering its maritime ISR and anti-submarine warfare (ASW) capabilities with a broader P-8I is understandable, given recent forays into the Indian Ocean Region (IOR) by Chinese submarines, including People’s Liberation Army Navy Type 039 Song- and Type 093 Shang-class submarines over the past year (a development confirmed by the U.S. Defense Department in its 2015 report on China’s military). According to a report by Agence France-Presse, India’s Defense Acquisition Council, the government body in charge of approving large defense purchases, approved an order for 428 air defense artillery guns late on Tuesday. “The council has cleared proposals relating mainly to purchase of air defence guns and long-range patrol aircraft for the navy,” the official told AFP. The deal could add ballast to burgeoning U.S.-India defense ties. Indian Defense Minister Manohar Parrikar and U.S. Defense Secretary Ashton Carter renewed the U.S.-India defense cooperation framework agreement, originally signed in 2005, for another decade in May 2015. The United States has emerged as India’s top arms supplier, supplanting Russia, which has traditionally held that distinction. India’s Ministry of Defense placed a follow-on order for four more U.S.-made Poseidon 8I Neptune aircraft this week.